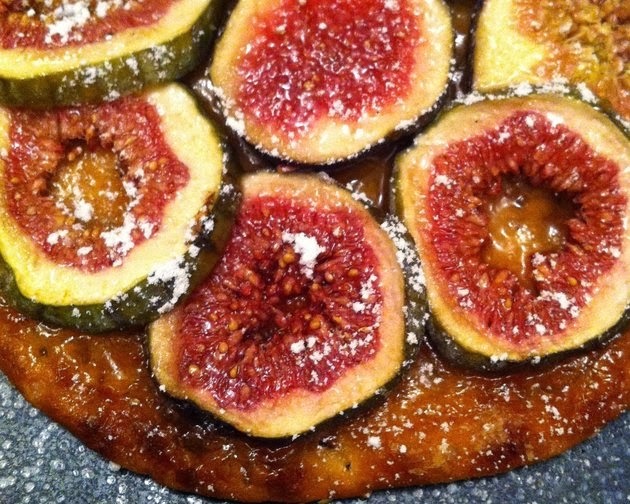 Jacob's Crackers: Figs... The food of the Gods and a few simple ways to serve them. Figs... The food of the Gods and a few simple ways to serve them. Figs are an ancient fruit, cultivated way back by the ancient Egyptians as long ago as 1900 BC. Certain legends even claims that Eve ate a fig not an apple and subsequently the fig leaf was used to cover her modesty. Whatever the truth , I can only affirm that there is nothing like eating a ripe fig at the height of their season in Summer. They are lusciously sweet with a delicate aroma, silky juicy flesh,crunchiness of the seeds and smoothness of the skin. So no wonder they have been enjoyed for centuries, for these are the food of the Gods. While native to the Middle East and Western Asia, they are widely grown throughout continental climates of the world. Although commonly referred to as a fruit, the fig is actually a pod or sac (a false fruit) in which the flowers and seeds are borne.It is pollinated by a fig wasp which enters the fig through a tiny hole at the crown of the fruit. Figs range dramatically in colour depending on the variety but are normally grouped into White, green,red and purple/black. Today, California is the one of the largest producers of figs followed by Turkey, Greece,Portugal and Spain. Figs are a good source of Potassium, Iron & dietary fibre. 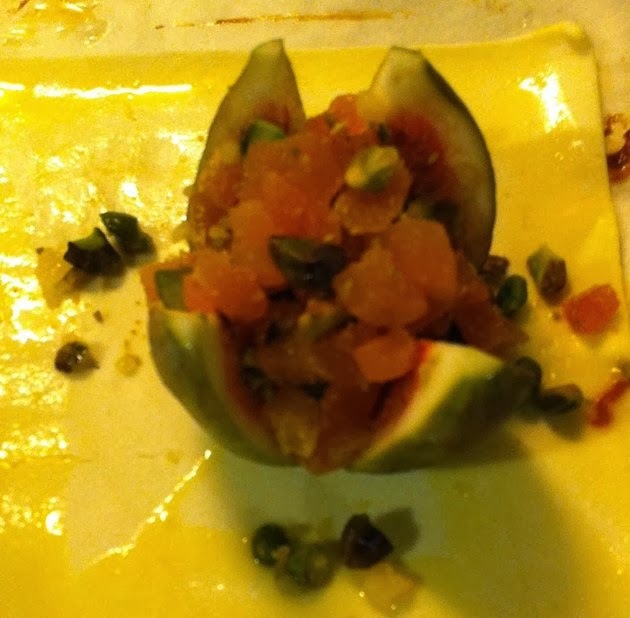 Fresh figs being delicate and easily perishable, makes it a Culinary delicacy par excellence. Look for plump,tender fruits that are free of bruises. If they smell sour, they are past their best. Wrapped in tissue, they will keep in the fridge for a few days. Before use, wipe the skin with a damp cloth, trim off the stems. Keep them whole with a deep cross at the top end for poaching. Cut from top to bottom into halves or quarters or Slice into thick rounds for salads and desserts. Alternatively, you can make a fig flower by making a deep cross at the top end, cutting almost but not all the way, squeeze the base and the quarters should open out like petals. 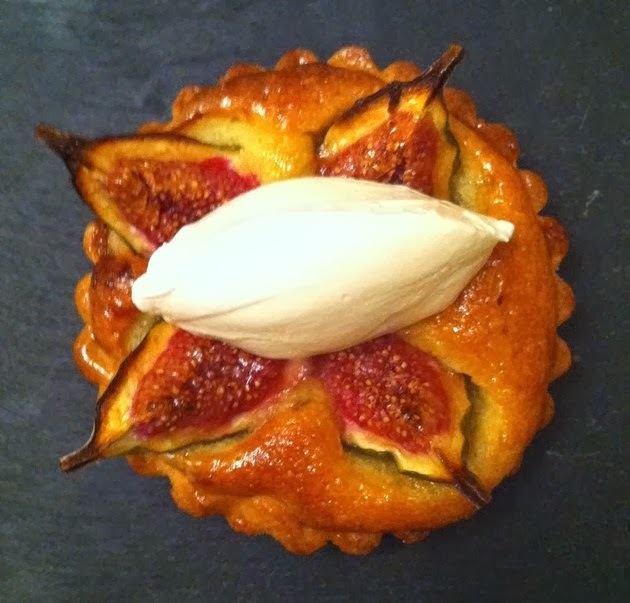 Here are my favourite ways of serving figs. I like to keep it simple and allow the fruit to speak for itself. The following recipe is one we used to make when I worked in Gordon Ramsay in London. It is fairly straight forward and absolutely delicious. The Sable Breton base freezes very well and can be topped up with lots of different fruits when in season. Beat the egg yolks, vanilla and sugar together with a paddle attachment of your mixer until it becomes white and has gained some volume. Then add the sifted flour, baking powder and salt to obtain a sablé. Last add the butter and mix well to incorporate . Divide the dough and roll out between two sheets of grease proof paper to required thickness. Chill for at least 30 mins. Cut out your selected shape and bake at 160c for 10 mins. Spoon some plum jam on top and spread thinly. Arrange and overlap the sliced figs all around. Drizzle with honey and icing sugar and return back to the oven for another 10 mins or until bubbling. Sift flour & salt onto a cold work surface , make a well in the centre. Add the butter, egg yolks and sugar to the well. Use your fingers or a palette knife to work the ingredients together. Now , with your hands , work the mixture into a smooth dough . Wrap in cling film and chill for 30 mins before use. Roll out your dough to line a greased & floured flan tin . Ease the dough into it . Trim the edges and prick the base with a fork all over. Line the flan with a cartouche of greased proof paper and filled with baking beans. Bake at 1900c for 20 – 25 mins. Remove the beans and paper and return to the oven for a further 5 mins. Cream the butter & sugar and gradually add the beaten eggs. Fold in the ground almonds and mix well. Brush each tartlet case with a bit of the plum jam.Spoon in the almond mixture. 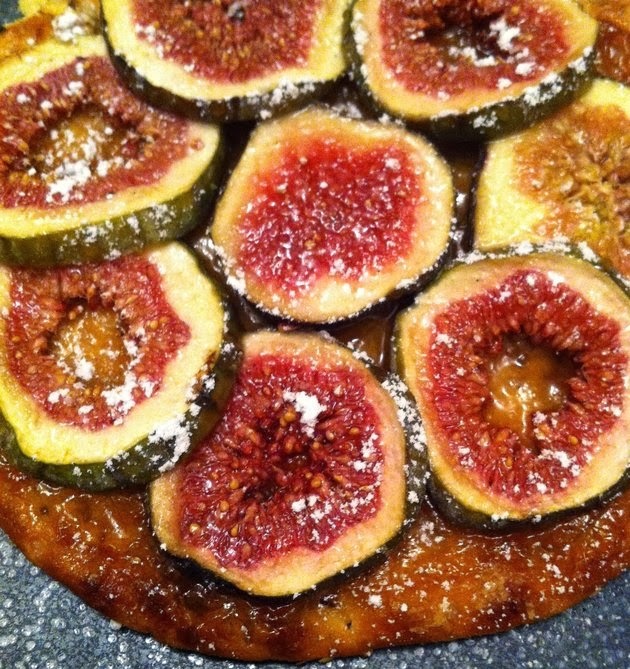 Arrange the fig on top and bake in a preheated oven at 200c for 10 - 12 mins, until the sponge has risen and golden. In a small saucepan, melt the remaining jam and a drop of water into a glaze. 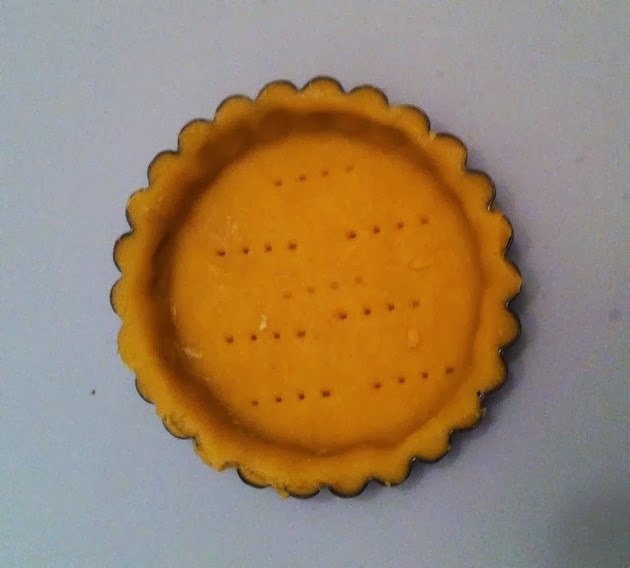 Brush each tartlet and leave to cool. Serve creme fraiche. This is a delicious Mediterranean adaptation of the Normandy apple tartlet using figs and has the taste of the delicious sweet Baklava. Slice the figs into a flower without cutting all the way through. Pack in tightly the chopped apricots & pistachios. 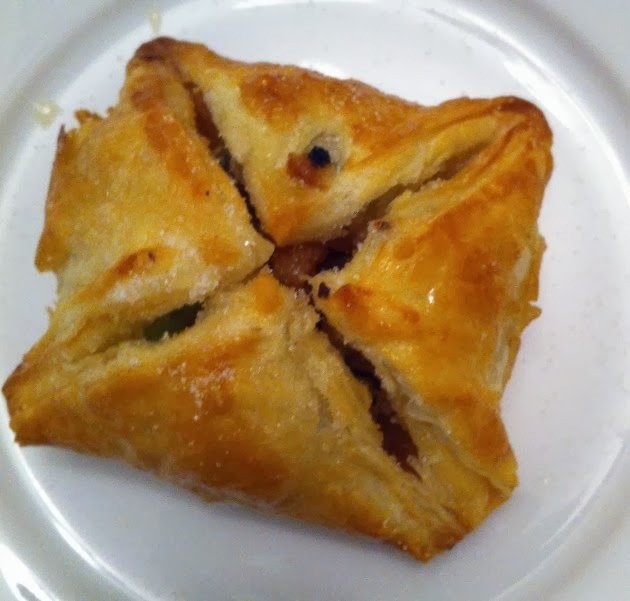 Place in the middle of the puff pastry square, Drizzle with honey. Brush all sides with the egg wash and fold over the flaps around the fig. Brush with the egg wash, sprinkle with the caster sugar and bake in a pre-heated oven at 200c for 10-15 mins, until all puffed up and golden. Serve with Greek yoghurt or thick clotted cream.